In the summers my family and I love to go to theme parks. 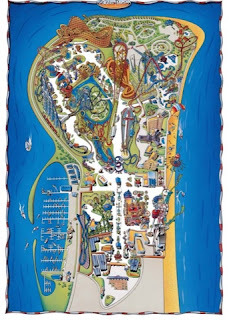 This year we decided to go to Cedar Point "The Roller Coaster Capital Of The World" in Sandusky, OH. We upgraded our Kings Island season gold passes to platinum passes and decided to take three weekend visits for the season, since it takes us half a day to get there. 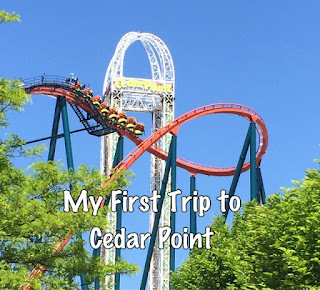 If you don't know much about Cedar Fair season passes, the platinum pass gives you the option to visit all of Cedar Fair owned theme parks for free, well for the cost of the platinum pass. Our first trip was actually a spur of the moment weekend trip, over Memorial Day weekend. I forgot all about my husband's and mine 9th wedding anniversary and having a three day weekend due to Memorial Day, what better gift to utilize our newly upgraded season passes and take a family trip. I was able to get a reservation in the newly renovated Hotel Breakers. May I add... I loved the location and all the new amenities to this hotel. I was actually shocked that I got a reservation so close to our check in date. The big plus about this hotel is that it is steps away from the park. I enjoyed being able to go back to our hotel room at any given time. Trust me that is a blessing when you have little ones. With this trip being a spur of the moment trip neither one of us really had a good game plan. We felt like we were lost fish in a sea of rides and people, everywhere we turned. We stayed for two nights and 3 days and it took me that long to figure out where the front of the park was. You got to remember, when you stay at Hotel Breakers you are basically staying inside of the park. The theme park is U-shaped all around the hotel, and they provide you two entrances, one on each side of the hotel to enter the park. I learned about the second resort entrance on day two of our trip. As we were driving there our navigation took us to the front gate parking lot. I remember pulling up to the attendant with a confused look on my face. I was like, I think I missed my turn, we are going to Hotel Breakers. She laughed and said no you are at the right place. She told me to go on through and hang a left then a right and follow that road until it ends at our hotel. Driving that road with Lake Erie on one side and roller coasters on the other was just beautiful. It was hard to focus on the road because I was looking around everywhere. Watching Lake Erie splash up on the rocks, that separated it from the road, was beautiful. The workers at the park are so nice and they are good at giving directions. Still to this day after three visits I have yet to see the Peanut Gang. I read on a sign that they do a show at 5pm, we never have been in that part of the park at that time. I have seen Snoopy in the lobby of our hotel for breakfast and for bedtime. I wished they walked around the park or at least have designated times to be in certain areas of the park. Who knows they actually could have, and I just don't know it. One of the big things I learned about the park was the Parent Swap Program. I did not inquire about this until our third trip. Talk about being down about missing out on all the fun rides, I could have have been using this program along. If you don't know what the Parent Swap Program is and you have little kids, you really need to read this. You receive a pass and one of the parents goes ride the ride with one of the children and the other parent stays at the exit of the ride. When the parent and the child gets off the ride they hand that voucher to a worker on the ride and then they exit. As soon as they exit the parent that was waiting with the other child that is not tall enough can walk up the exit and ride the ride. You can even take the same child back that just got off the ride. Win win there. This is a great way that both parents can ride the ride. I can say, I have now covered every inch of the park. I would not say I am a pro at the park, but I have learned a few tips. Stay tuned and next week I will provide my Cedar Point Tips.